For the first time ever, cities can measure their progress towards Agenda 2030 with a common set of broad indicators, as developed by the Sustainable Development Solutions Network. The U.S. Cities SDG Index was presented in a new report, "Achieving a Sustainable Urban America", which uses the index to rank the country's 100 most populous cities, using statistics for their metropolitan areas, and looks at them against each of the Sustainable Development Goals (SDGs), addressing issues such as poverty, education, health care and infrastructure. While concluding that U.S. cities have a long way to go to meet sustainable development targets, the report describes the purpose of the Index, saying that "The U.S. Cities SDG Index provides a snapshot of sustainable development across America. By highlighting the best and worst performing metropolitan areas, exposing regional disparities and persistent problems for all cities... it aims to galvanize efforts to tackle the sustainable development challenge." This new tool will be invaluable to cities, as it can help them to compare progress towards meeting the challenges they share not only with other cities in the U.S. but potentially also with urban areas around the world. Read more about the index here. Mental illness often flies under the radar in Japan, but that doesn't mean that urban planners don't take it into account when designing Japanese cities. As in most cities, many people in Tokyo struggle with mental illness that can be made worse by their urban lifestyles. But Tokyo urban planners and policymakers, who consider reducing the high level of stress in the city to be a main priority, are doing things to improve mental health that cities around the world should pay attention to. The Center for Urban Design and Mental Health recommends that cities incorporate four main themes into urban design to support mental health: green spaces, active spaces, social spaces, and safe spaces. While Tokyo urban planners tend to implement new programs and initiatives with physical health in mind, their work- combined with their concern about stress- has created green, public spaces that improve emotional well-being as well, whether they intended to or not. From community-built parks to a focus on pedestrians to an encouraged outdoor lifestyle, Tokyo's policies have done wonders for its residents emotional stability, and its successes can be valuable lessons for cities whose populations are struggling with things like isolation and anxiety. Mental health is one of the many components that need to be improved in order for a city to become truly sustainable and inclusive, and it is important that it is viewed as as much of a priority for cities as physical health. Learn more about Tokyo's health programs here. Last week, IHC Global talked about what measures could have been put into place to prevent the devastating mudslides that happened in Freetown, Sierra Leone, and what could be done to help Sierra Leone improve disaster preparedness for the future. But Sierra Leone is already ahead of the curve when it comes to learning from past experiences, with respect to meeting disasters when they occur. In the hours, days and weeks following the deadly mudslides, scores of ambulances, trained medical staff and volunteers swarmed the disaster area, to assist in everything from search rescue to digging graves, and measures to prevent the spread of water-borne diseases like cholera were immediately put into effect. For a poverty-stricken country with struggling infrastructure, the response to the mudslide was rapid and organized. The reason? The Ebola crisis. The virus that choked much of West Africa three years ago completely ravaged Sierra Leone, but left it with a legacy of rapid response mechanisms that would remain useful even after the outbreak faded. Because of the Ebola crisis, Freetown had more medical equipment, organizational response capacity and disaster-trained citizens at their disposal than ever before. It is unfortunate that fine-tuning a system comes from learning from past horrors, but if cities can adapt as well as Freetown has, perhaps every disaster will be smaller and less catastrophic than the previous one. When does historic preservation become social justice? The Preservation Leadership Forum is tackling this question through a series of blog posts this summer, highlighting their work in preserving historic places and how it connects to intersectionality and inclusion. The blogs are from an array of different perspectives, and cover the various ways urban neighborhoods are striving to protect their city's historic and cultural monuments, from preserving the public art that decorates many urban buildings to preventing foreclosure of the houses of faith that are staples in their communities. Around the world in both urban and rural areas, women entrepreneurs are increasingly being seen as an underutilized asset. And while there have been amazing efforts to mobilize women in business, like the launch of the Women's Entrepreneurship Facility (We-Fi) at the G20 Summit, there is still plenty room for improvement. Join a panel of experts from the World Bank, WeConnect, and the Global Banking Alliance for Women for a discussion of how to formulate a holistic approach to the pressing issues that stand in the way of women's empowerment as entrepreneurs, and how best practices across sectors can be combined to have a lasting impact for women in the business world. Cape Town, renowned for its natural beauty and a draw for tourists, has a huge affordable housing problem, one that has gotten worse as the city has developed over the past years, becoming an even more attractive place to visit, live and do business. Like many other major cities in the world, regardless of region, Cape Town has not yet found a solution to its affordable housing challenge. As of December of last year, there were only 116 units available for rent in the city center, and the average one-bedroom costs about $1170 per month. With a national minimum wage of $270 per month set to go into effect in 2018 and a safety net system that still has too many holes, living in the city center remains a privilege that is unaffordable to a large majority. The economic housing barriers in the city center largely stem from the legacy of Apartheid and its racial housing barriers, which reserved the central city for white South Africans, and relegated black and colored residents to the city's outskirts. The problems that remain from the Apartheid-era layout have only been exacerbated by gentrification. The city estimates that it will face an affordable housing gap of 650,000 units over the next 15 years. But the good news is that Cape Town is actively working on the problem! Under the leadership of Mayor Patricia de Lille, the city government is seeking ways to meet the challenge, and a new project offers private developers the chance to obtain prime land in the city center by submitting proposals for mixed-use development that includes affordable housing. So far, six big-budget proposals are in the running. But while this could be the best step forward for Cape Town, the partnership's requirements- and the projects themselves- are already fostering controversy. On the one hand, this idea of a public-private partnership to stimulate affordable housing delivery in Cape Town could be a great new direction for the city, and also remedy several of the outstanding infrastructural issues, including the unfinished transportation systems and the several empty lots that litter the area. It's also an interesting kind of public-private partnership, as the high housing and property prices in Cape Town mean that the city needs the private sector far more than the private sector needs the city. However, the uncertainty that is brewing among housing rights activist organizations lies between the lines of the partnership proposal. Critics have called the parameters of the partnership vague, and they are right to; nowhere are there any specifications for how many affordable housing units the proposals need to have to be selected. And, while this has been explained as an incentive for the proposals to not be held back by a number and instead be competitive with how many affordable units they can fit into their plans, many critics aren't buying it. Prominent housing rights organizations, some of which have been deep in the battle for affordable housing with the city government since as early as 2008, think these parameters- and the "beggar" situation the city is in- give too much control to the private sector, and that affordability could be lost on the way to building up the city. Housing affordability must be a priority for Cape Town going forward, and IHC Global believes that a public-private partnership initiative such as this could provide a great opportunity to improve equity in the city if some of the questions surrounding its implementation-such as how many affordable housing units are required, and how exactly 'affordable housing' is defined-are addressed. From the private sector developer side, the opportunity may be greater than it looks, since the high end of the property market, even though robust at the moment, can only be strengthened by making the entire city "livable" for everyone. Affordable housing is one element of the whole, but can be a driver of other initiatives, and can also help to address issues on the outskirts of the city and in those struggling neighborhoods where income and racial inequality is the most visible. IHC Global hopes that a positive outcome from this project will spur more projects in and around the city, so it can become as inclusive and sustainable as it can be. The challenges are not simple, and Cape Town's approach takes bold political leadership that many cities around the world can learn from. Mexico City is getting rid of parking spaces. Lagos keeps growing and growing and growing. Are floating homes the solution to how we can live among rising seas? There are some cool board games about cities out there. What can they do to help us understand urban planning? Third Wave Urbanism: a rockin' podcast in which two female urbanists dig deep into globalized cities. 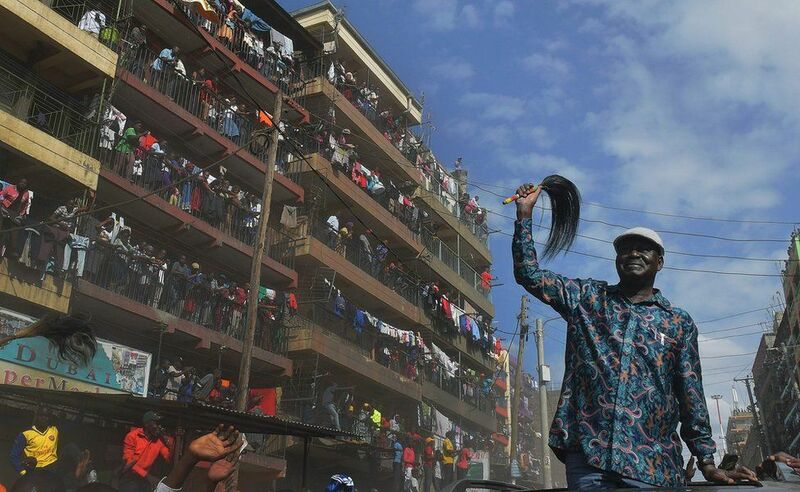 This week in cities: after a week of post-election chaos, Kenyan opposition leader Raila Odinga walks through the streets of the opposition-stronghold Methare slum in Nairobi. Raila was defeated by incumbent president Uhuru Kenyatta in the presidential elections last week, but will challenge the results in court.